At least 12 civilians were killed and 10 others injured when three militants attacked a Delhi-Jammu bound bus at Hiranagar Morh in Kathua district today. According to eyewitness reports five persons died on the spot, six died in hospital and one, an ex-sarpanch, Janak Raj, was killed when the same group of militants opened fire while he was working in the fields. The police has confirmed the death of eight persons. According to doctors the condition of five persons were serious. Just 15 minutes before the start of polling in Kathua district three clean shaven militants, in police uniform, got down from a Matador which they had hijacked from the border area of Londi. As soon as they spotted a passenger bus coming they signalled it to stop. A man injured in the attack being looked after by his father at a hospital in Jammu on Tuesday. Eyewitnesses said as the driver slowed down the vehicle one of the three militants stood in the middle of the road and the driver thinking it was routine police checking, stopped the bus. 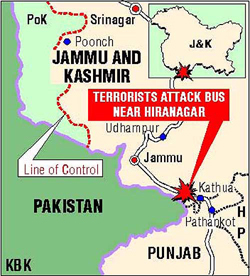 The militants hurled a grenade at the bus damaging the portion of the bus. This was followed by indiscriminate firing when the driver and the passengers refused to open the doors. In the indiscriminate firing five persons, including two autorickshaw drivers, who were waiting at the bus terminal were killed. More than 12 passengers inside the bus received bullet injuries and some of them were injured with grenade splinters. Five of the killed have been identified as Vikrant, Satish Kumar, Sanji Ram, Chamanlal and Janakraj Arya. Kuldeep Singh and Mohinder Singh died on way to the Jammu Medical College while Janakraj Sharma died at District Hospital, Kathua. The injured were carried to hospital in three wheelers by residents of the area who carried out rescue operations, when there were no government agencies, available on the spot. Eyewitness accounts said the militants had hijacked a Matador and tried to force the driver to carry them to some Army camp or brigade headquarters. The driver expressed innocence and when the Matador reached Hiranagar Morh he hit a pole and fled into the fields which made the ultras to get down at Hiranagar Morh. Police said the conductor of the bus was also killed in the firing. The Army was called in to assist the paramilitary forces and the state police in nabbing the killers. The police claimed that one of the three militants had been killed while the eyewitness accounts said the ultras had escaped into the nearby forest belt. The police believes that the militants had infiltrated from across the IB a day before the polling. According to police sources the main target of the three ultras was some Army camp as they had forced the Matador driver to carry them near some Army unit. When they failed to get closer to some Army camp they targeted the bus and those waiting at the bus stop. Meanwhile, the Union Minister of State for Defence, Prof Chaman Lal Gupta, condemning the ultra attack on passengers, most of them pilgrims to Vaishno Devi, said it was yet another attempt by the Pak-aided militants to disrupt the poll. Prof Gupta praised the voters of Hiranagar and other constituencies for having ignored the scare caused by the militants by turning up at the polling stations in large numbers. He said today’s heavy polling in the border district of Kathua should be an eye opener for Pakistan. SRINAGAR: The Jammu and Kashmir Chief Minister Farooq Abdullah on Tuesday condemned militant attempts to disturb the poll process in the third phase of elections in the state. He also expressed anguish over the killing of innocent bus passengers at Hiranagar by militants. The little-known militant outfit, Al-Mansoorian has claimed responsibility for today’s attack on a passenger bus on the national highway in Kathua in which 12 passengers of the Delhi-Jammu bus were killed and more than 20 injured. The militants were in army uniform. This information is based on wireless intercepts which were probably purported to be intercepted by the militants’ Pakistani masters, well-placed sources said. Al-Mansoorian was a cover for the Lashkar-e-Toiba, the sources said. Al-Mansoorian had earlier claimed responsibility for the attack at Kaluchak on May 14. Al-Mansoorian’s name cropped up only to claim responsibility for specific attacks by the LeT. The police set up here has once again been caught napping with the gunning down of 12 civilians by terrorists on the busy Jammu-Pathankot national highway near Hiranagar today. The incident has exposed laxity on the part of the police which has been claiming to have tightened the security particularly in the districts where polling was being held. Victims of the terrorist attack and the eyewitnesses said the police reached the spot about 20 minutes after the terrorists had killed the passengers of the tourist bus which was coming here from Delhi. The injured were carried to the hospital in auto-rickshaws. It appears that the police had not taken any precautionary measures in the area even after the interception of wireless messages to various terrorist outfits from Pakistan to disrupt the poll. This is the second terrorist strike on a bus on the same highway in the past five months. The earlier one was in May in the Army cantonment area of Kaluchak when terrorists stopped a passenger bus of Himachal Road Transport Corporation (HRTC) and shot dead nine passengers, including three women. They later forced their entry into the residential complex of Army personnel and killed many women and children. The death toll was 32. As many as 29 persons were killed by terrorists who swooped the Qasim Nagar locality in the outskirts of the town on July 13. Earlier in March, terrorists entered Raghunath temple in the heart of the town and over 10 persons were killed in the grenade attack and firing by them. The state government has already come under severe criticism for diverting grants meant for modernising the police to meet the challenge of terrorists. The Comptroller and Auditor General of India had recently pointed out that money out of the grant was utilised for furnishing the residences of senior officials and influential persons. Meanwhile, a defence spokesman said that three foreign mercenaries were killed by the security forces one each at Nagrota, Kair Nala and Munglor, respectively and arms and ammunition were recovered. Two other terrorists were arrested.